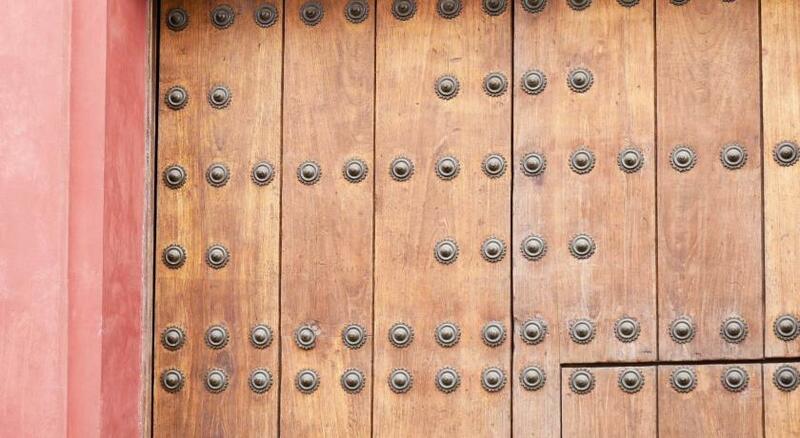 Lock in a great price for Hotel Alminar – rated 9.3 by recent guests! The location is unbeatable! The staff is very nice and friendly. 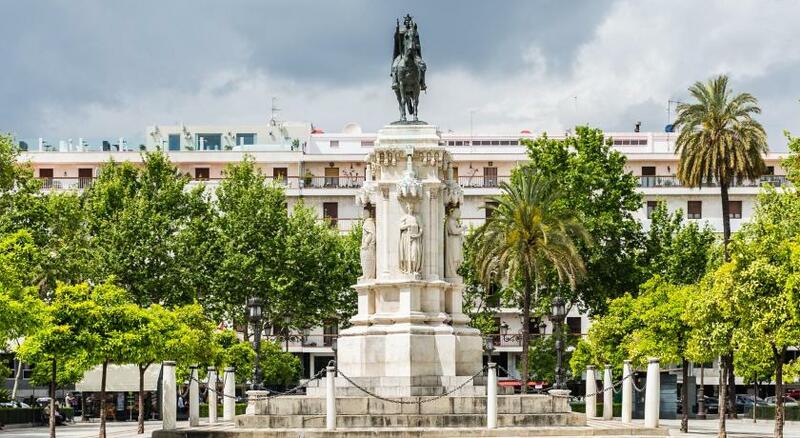 It is a clean, comfortable, no frills hotel located in the perfect location close to the cathedral, main streets and sights, bars, restaurants, tram and metro. 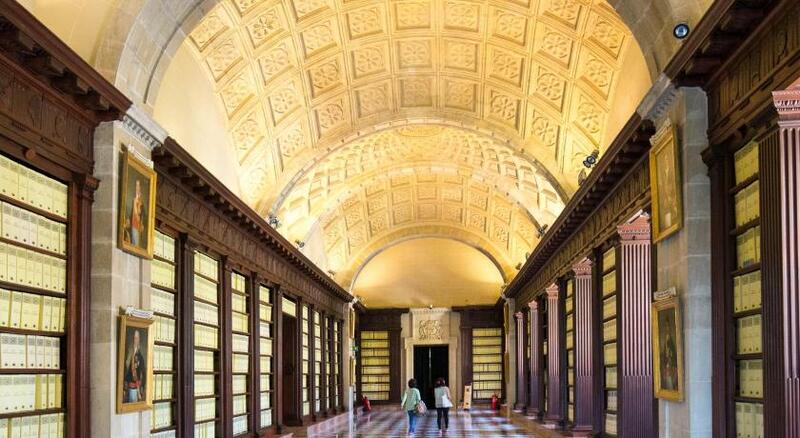 A great place to use as a base when exploring Seville. Comfortable, clean, excellent location. Highly recommend. This is a centrally located hotel with friendly and helpful staff. The noise is for real, but you wouldn't expect it to be quiet in the middle of everything. Very helpful lovely staff and an amazing location. The beds felt hard when I sat on it but was amazingly comfortable to sleep on. Lovely hot showers and a mini fridge was a bonus. The hotel is beautifully updated. The rooms are quite comfortable, the lobby area is stylish and the free coffee bar is divine. 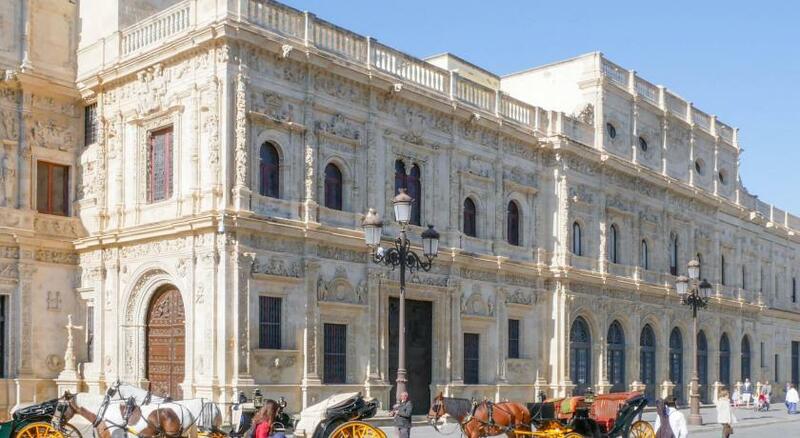 The staff was so thoughtful and knowledgeable about restaurants, activities and the history of Sevilla, which made the stay even more enjoyable. Hotel Alminar This rating is a reflection of how the property compares to the industry standard when it comes to price, facilities and services available. It's based on a self-evaluation by the property. Use this rating to help choose your stay! 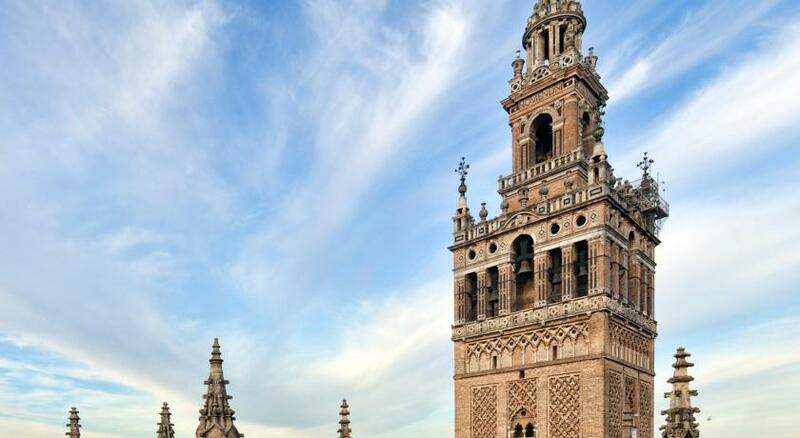 Hotel alminar is a small hotel of only eleven rooms (fully equipped and truly charming) which is placed in a quiet pedestrian street in the very center of Seville, just 150 feet from the cathedral and its minaret (alminar), la giralda. 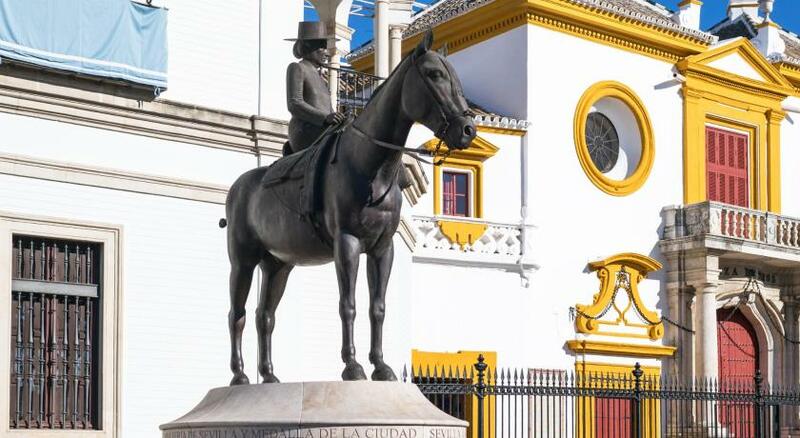 Alminar is the ideal spot for those who would like to visit all the monuments and cultural centers of the city without having to take any transportation as everything is easily accessible from the hotel. When would you like to stay at Hotel Alminar? 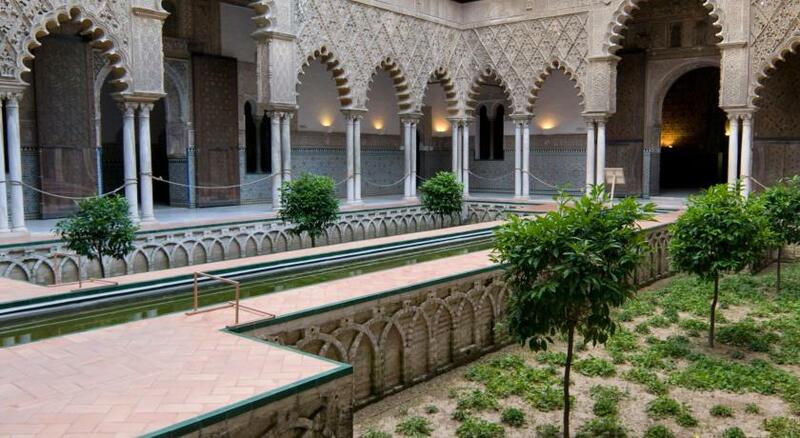 Air-conditioned rooms with a Juliet-style balcony. There's a TV, CD player and minibar. The private bathroom comes with a hairdryer and shower. House Rules Hotel Alminar takes special requests – add in the next step! Hotel Alminar accepts these cards and reserves the right to temporarily hold an amount prior to arrival. Weird design in the bathroom (frosted glass swing door next to the bed.. no privacy, quite embarrassing for couples!! ), and bad pillows. Very expensive, especially as breakfast not included, but i guess its the location. I think there's more value for money elsewhere. Location unbeatable and terrace is lovely. Semana Santa and it‘s special conditions is requiring some special measures like ear-plugs due to the „noise“ of all celebrating people and the workers early in the morning cleaning the streets. But this is how it is and I could sleep well! Nice Hotel in the center of the city. Free cake and coffee in the afternoon. Very polite, supportive and nice staff! Room big enough, water for free. Only some steps to all place around the cathedral. Excellent location. Very friendly and helpful staff. friendly staff and location, .. Pretty happy to be honest. Only thing would be that the drains were a bit slow in the bathroom. The staff were friendly and very helpful. The breakfast was value for money and included lactose free milk which was an expected bonus. The free coffee/tea and cake on the ground level is great - and you don't really miss having the facilities in your own room. A stone's throw from the Cathedral - handy to all the major attractions. If you have a rental car - recommend using Calle Cabo Noval to unload and leave the blinkers flashing while you drop off the bags. Can't say anything bad, it exceeded my expectations! 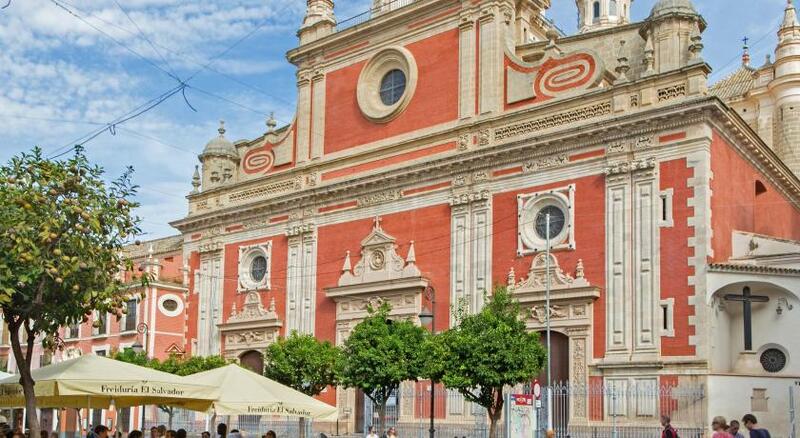 The hotel is located in the heart of Sevilla, very close to the Cathedral. The street where the hotel lies is very small, so there's no noise. The room was very spacious, way bigger than the usual (tiny) size of hotel rooms. Maybe needed a bit more variety at breakfast, and some better quality cheese. Excellent location on doorstep of main sites and good restaurants. Brilliant staff - so helpful and informative. Great to be able to get tea, excellent coffee and cakes during the day. Very relaxing. The hotel was in an excellent location. Right beside the Cathedral. Staff were so friendly and helpful. Would definitely recommend it. Although I had a single room it was a good size with excellent sized bathroom, and everything was spotless. Staff were very friendly and helpful, offering excellent advice on places to eat and information on local attractions/bookings etc. the staff provide some wrong info for the attractions. Very convenient to every spot. lots of good restraunts around the hotel. room is big. snacks ,hot water ,tea and coffee in the pantry are free. This hotel is lovely. The staff are attentive and caring and the rooms are clean, comfy, modern, and attractively decorated. The bathrooms are large and I prefer waterfall shower heads which this hotel has installed. 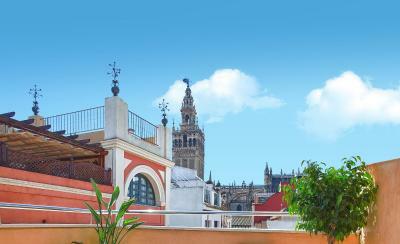 Overall I would highly recommend this hotel if you want a hotel that is boutique like and right in the heart of the old town section of Seville. It's down a side street which is pedestrian so keep that in mind if you are coming with a lot of luggage. There is a lift. The walk from the Main Street, is about 5 minutes, but with more than one suitcase that walk may feel challenging; I only had one suitcase so for me was not a hardship. Anyway, this is a lovely hotel and I will stay here again when I come back to Seville :).